Android 2.2 is rumored to be coming out in a few days for my Verizon HTC Droid Incredible. I can't wait! The big ticket items I'm looking forward too are the huge speed boost and full support for Adobe Flash, meaning I can have full unencumbered access to all the video on the web. I'm also hoping it will fix a few minor annoyances I have with the phone such as the screen dimming / undimming erratically when I'm on a call. 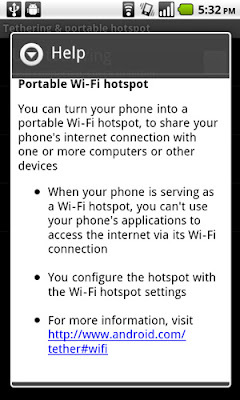 Another big ticket question is will it fully support tethering so I can use it to connect my laptop to the Internet when on the road or has Verizon has somehow disabled the feature? It's supposed to be a key feature of the Android 2.2 release but cell phone carriers like Verizon are infamous for disabling features that don't suit their fancy so I'll believe it when I see it. Among other things I've been putting off setting up a computer next to the TV to use as a media center because once I can run Flash on my Android phone I can use it as a full blown media center. I will even have a number of options to control it including VNC and potentially a bluetooth remote though I'll likely stick with VNC since I tend to work on my laptop or at least keep it handy when watching tv. While full Flash support completes the Android phone's capabilities as a full on media player / media center even without the ability to watch video in Flash I use applications like Pandora and Slacker to listen to music constantly at work. I think my data usage was 3.5gigs last month, so obviously these are a couple of my most used appications right next to google's Gmail app. Ironically I've not yet bothered to put my extensive MP3 collection on it and may not so long as applications like Pandora and Slacker suit my needs. I've also become fond of an application called BeyondPod which is a podcast aggregater for Android. I've not yet been able to fully utilize it yet because of a few probably minor bugs but I have been using it to follow some of my favorite podcasts like MTBcast's coverage of the Tour Divide (the mountain bike race down the great divide). I'm hopeful that in the future applications like Boxee will come to Android and further enhance it's ease of use with an integrated media playing experience.